Mocha Coffee Bean Milkmade Soap...a gentle cleansing formula with a faint sweet cream aroma that gives a luxurious, creamy lather. The finely ground coffee beans are great for light exfoliation. The botanical name for coffee essential oil is Coffea arabica L. No synthetic fragrances or colors are used. The silky conditioning lather from the raw butters (Shea & Cocoa), and rich creaminess from local raw goat milk from Belleville, PA (Amish Country) make this a great bar of soap for your skin and senses. All of my handmade soaps are scented with organic or wild-crafted essential oils, so they're great for those who are sensitive to synthetic fragrances. Lightly scented, so they're not overpowering. Just a subtle, pleasant aroma while bathing or hand-washing, and the scent won't remain on your skin afterwards. 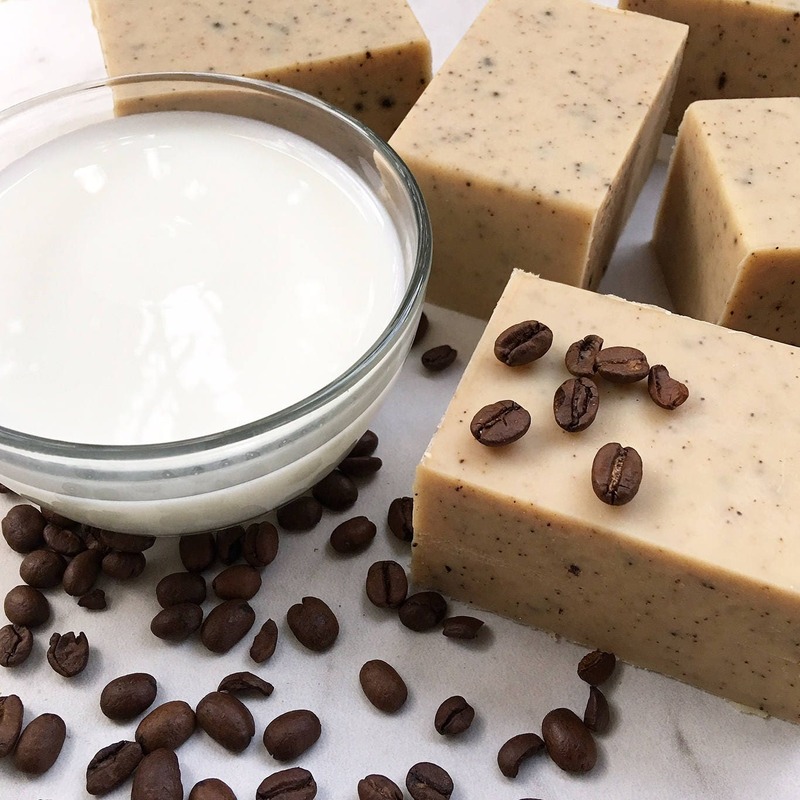 This soap doesn't smell like coffee, even though there are finely ground coffee beans, fresh brewed coffee, and coffee essential oil included in this recipe. It has more of a very light sweet cream aroma. Each large handmade bar of soap weighs approximately 5.5 - 6.5 oz. Each bar is hand cut and beveled, so the look and weight may vary slightly, and measures approximately 3" long x 2-1/8" wide x 1-1/2" thick. Handcrafted soap bars will last longer if they are allowed to dry fully between uses. To prolong the life of your handmade soap, always store in a slotted or deeply ridged soap dish. Do not leave your soap in standing water. Shipping charges provided are for one large bar of soap. Please contact me if you'd like to purchase additional bars, and I'll provide you with an updated shipping quote. High quality soap. It is moisturizing and lightly exfoliating with a creamy lather. I have used it several times before reviewing and see that it will last well ( I keep my soaps in a slotted holder so they don't sit in water). Packaged nicely and shipped quickly. I will definitely buy here again.